This project was undertaken at a private residential property in Hadleigh, Essex. It is a privilege to return to this garden to undertake maintenance works for the trees and shrubs in the garden. 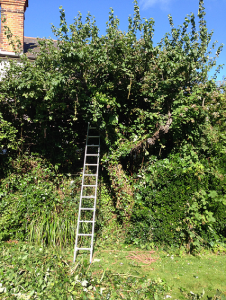 The photos are of an Apple tree covered in ivy and bramble. After a few hours work with a silky saw, the apple tree was free from the ivy and bramble. 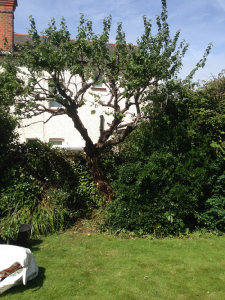 The reason for the works was to undertake regular maintenance tree and shrub works. There is an apple tree here!